It’s Thanksgiving Day. I don’t really love this holiday, but I love my friends, so I will be sharing a meal with them. Right now I’m home, watching the parade, counting (some of) my blessings. I have family who made sure I know they are missing me and love me very much. I have friends who will put up with my whining and STILL want to eat with me. Or at the very least, text or talk with me! I was lucky enough to spend this morning with myself and my cat, thinking and writing. I got to spend part of my quiet morning making a side dish for today…something I used to make with my mother…something my aunts made (with gentle family sparring over whose was best). While doing so, I got to revel in all.the.memories. I had yemisee* for breakfast! Later, there also will be wine. While it’s been a tough year, I’ve learned a lot about myself. The list could go on, but the cat wants a cuddle. For what are you most thankful this Thanksgiving? 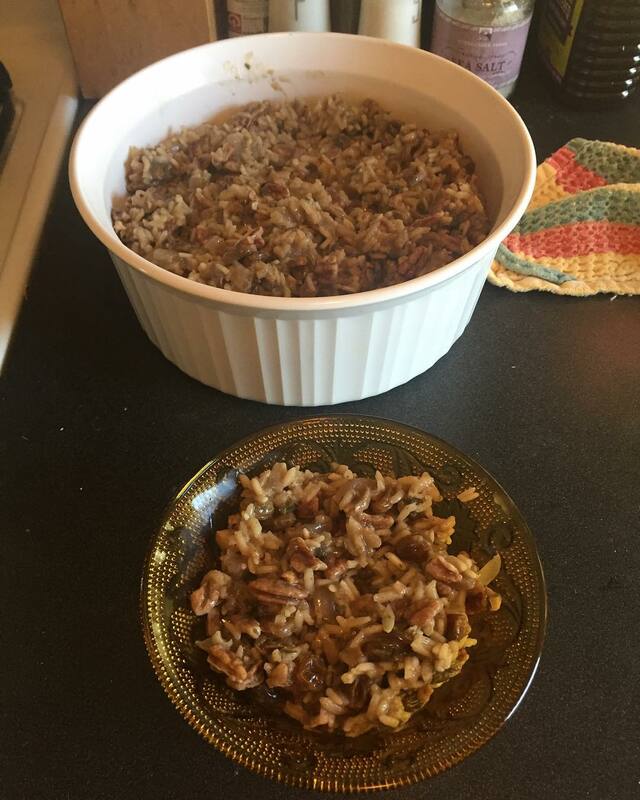 *Yemisee: A Greek dish based on rice, onions, mushrooms, raisins and pecans. You can make it with meat or without.